Competitive bass fishing started right here in Texas, and it's still on the rise. It’s a winning catch, and fans spring to their feet with a roar as photographers jockey for position, trying to get that front-page shot or 10-second prime-time sound bite. But no end-zone dance ensues, and instead of spiking an oblong spheroid into the grass, the athlete hoists aloft a football of another sort, a wriggling, thick-shouldered fish with a gaping mouth, bulging eyes and flaring, blood-red gills. Another bass fishing tournament has reached its climax, and the epilogue follows shortly: presentation of a prize that can be as much as $500,000. Scott was the first entrepreneur to recognize the potential bass fishing held as a competitive, money-making enterprise, but it was a Waco sportswriter who came up with the idea of pitting angler against angler to see who could catch the most fish on a given day. The only prize? 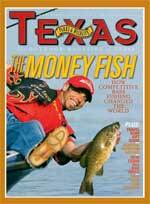 Bragging rights as the best bass angler in Texas. In the mid-1950s new reservoirs were beginning to come online in Texas, providing fishing opportunities theretofore unknown in a state with just a few natural lakes. One new water body was Lake Whitney, impounded in 1951 and centrally located in the state. It was a magnet for anglers, and coffee-shop arguments about who was most adept at catching fish from the lake reached the ears of Earl Golding, outdoor writer for the Waco Tribune-Herald. Sensing a story, he got his editor’s permission to stage a bass fishing tournament on Lake Whitney in 1955. The Central Texas Invitational drew 73 teams, and the next year Golding dubbed the event the Texas State Bass Tournament, the name it carries today. Although he didn’t know it, Golding had started something whose effects rippled across the nation and touched the lives of millions of people who never heard of Golding or the Texas State Bass Tournament, yet owed much to both. As new lakes continued to open in Texas, bass clubs sprang up around the state. New lakes in other states were attracting attention, too, and an Alabama insurance salesman with an addiction to bass fishing decided a hot new lake in Arkansas — Beaver Lake — was the place to try out a crazy idea he had: Get 100 anglers to pay $100 each to fish for a top prize of $2,000. That grubstake paid for a phone line for a month and a secretary named Darlene Phillips, and she and Scott started working the phone. “When they came to yank that phone out, I had 106 entrants,” he says. That organization became B.A.S.S., and today it has 650,000 members who come from every state except Alaska. According to B.A.S.S., Texas ranks first in the number of members; 1 household of every 188 in the United States has a member; and 1 of every 373 Americans belongs to B.A.S.S. One of those people, whom Scott refers to as his angels, was an insurance salesman from Texas, Ray Murski, who fished in Scott’s first tournament and introduced his own innovation there, a tractor seat mounted atop the boat motor that became the prototype for the seats used in bass boats today. Bass clubs were beginning to boom in Texas, and Scott came down on a recruiting and fact-finding mission. “We made a two-week tour of bass clubs around Texas,” Murski says, and Scott found Texas to be fertile ground. “I later got a lot of those people to join B.A.S.S.,” he says. The tournaments and seminars showcased the skills of many future bass fishing superstars like Bill Dance, Roland Martin and Tom Mann. More importantly, they fanned the flames of the bass-fishing fervor in people looking for a star to hitch their wagon to. One of those people was Johnny Morris, a part-time clerk at a discount store who wanted his boss to stock the kinds of gear the pros were using to catch bass. His boss turned him down, so he went into business for himself using money borrowed from his father. “Ray was creating a frenzy for tackle, and he was also creating heroes in the sport,” Morris says. “Fishermen simply couldn’t find the stuff at most of the big mass-market merchants, because they weren’t tuned into what was going on. Because I was competing as a regular on the early B.A.S.S. tournament circuit, I had a good insight into which products were really hot. There was a tremendous demand. That’s what gave birth to my business.” That business became Bass Pro Shops. Murski parlayed his interest in fishing into a career selling sporting goods; one of his early customers was a man from Arkansas who had a few stores and plans to someday be bigger than Target: Sam Walton. The chain he founded, Wal-Mart, became one of the major forces in shaping competitive bass fishing through its sponsorship of pro bass fishing tours. Ranger was actually a johnny-come-lately in the bass boat business. The first boat specifically designed for bass fishing was built in Marshall in 1948 and named the Skeeter for its needle-shaped nose. Now located in Kilgore and owned by Yamaha Boats, Skeeter continues to be a leader in the industry. It’s said that imitation is the sincerest form of flattery, and today the ideas of tournaments and bass boats have been copied and spread until it seems we’ve always had them. A key factor was television. Jerry McKinnis, who hired Forrest Lee Wood as a guide for his first fishing trip on Arkansas’ White River, started the Arkansas Sportsman Show in 1963 and went national with The Fishin’ Hole a decade later. In 1979 he met the leaders of a fledgling cable television network in their headquarters building, a single-wide house trailer, and told them he wanted to buy a half-hour block of time. The Fishin’ Hole has been on ESPN ever since, and in 2001 ESPN bought B.A.S.S., assuring ex-panded television coverage of bass fishing tournaments. Communities where bass tournaments are held win, too. In addition to the value of hours of television coverage, direct spending by anglers, sponsors and spectators at a major tournament is estimated to be as much as $600,000. But the biggest winners of all are the fish and the weekend anglers who pursue them not for money but for fun and food. Concern for the resource led B.A.S.S. and other fishing organizations to lobby for laws protecting the environment, and professional anglers took the lead in promoting catch-and-release. Perhaps the most significant development was the expansion of the Federal Aid in Sport Fish Restoration Program, which channels a federal tax on sporting goods to the states for use in conservation. The Texas Parks and Wildlife Department has received more than $237 million from the fund, annually receiving about 20 percent of its budget. Ray Scott credits help from then-vice-president George Herbert Walker Bush for getting the tax expanded to cover more categories of sporting goods in 1984. “The amount of money generated is four to six times what it would have been otherwise,” Scott says. Some may wonder why bass fishing went from being a pastime for barefoot youngsters armed with cane poles and cans of worms to a way of life for professional anglers, a weekend addiction for millions and fodder for countless television shows. Why did we take something simple and make it complex, in the process changing what is really a competition between a fish and a fisherman into a contest between anglers in which fish play only a supporting role? Tournament fishing, either as participant or spectator, is available to everyone regardless of age or level of ability. The following information will get you started. The Texas State Bass Tournament is open to all, amateurs and pros alike, and includes individual, team, couples, senior and adult/child divisions. See <www.texasstatebass.com>. The Bassmaster Opens. See <http://sports.espn.go.com/outdoors/bassmaster/index>. For information on the FLW Tour, go to <www.flwoutdoors.com>. American Bass Anglers, the largest tournament trail for weekend anglers, schedules dozens of tournaments in Texas and emphasizes close-to-home, low-entry-fee events. See <www.americanbassanglers.com>. Two other tournament organizations geared to the weekend angler with Texas events are Media Bass (<www.mediabass.com>) and Bass Champs(<www.basschamps.com/basschamps/>). The Couples Association of Sport Tournaments (C.A.S.T. ), founded so that couples could fish together, lists not only their own tournament schedule but also those of other major tours at <www.fishcast.com>. If you can’t travel to a tournament, both ESPN and Fox Sports Network offer extensive television coverage. For detailed schedule information see <www.espnoutdoors.com> or <www.fox sports.com>. Ray Scott tells the story of the rise of competitive bass fishing from his perspective in Bass Boss. The hardback book is available for purchase at <www.rayscott.net> or call (800) 518-7222.